This book is a GOLD MINE of information for anyone who is raising equity financing in Canada. It shows you how to do it yourself. It has been completely updated and revised for 2018/2019 to reflect the many changes that have taken place since the last edition was published in 2017. This Guide discusses the structure of the venture capital industry; what venturists are looking for and how they evaluate deals. It tells you how to contact them and provides 438 addresses. It reviews 74 upcoming venture capital and angel conferences as well as directories of venture capitalists and supplies you with the necessary contact information. Find out what informal investors or “angels” can offer and how to find them. Learn about the characteristics of angels and angel clusters. See if corporate angels, immigrant investors and intermediaries can be of assistance. The chapter on equity crowdfunding has been completely revised to reflect the most recent developments. You will find that this is a very exciting new area and could offer you an inexpensive way of raising equity financing for your business. You are given hints on negotiating with investors and some words of caution in dealing with angels and crowdfunding investors. This book is essential reading if you are seeking equity financing for your business or start-up. Iain Williamson is an entrepreneur, business consultant and seminar leader. His views have appeared in many newspaper articles. He has also been a guest on radio and has appeared on television shows such as: CBC TV’s Venture; TVO’s MoneysWorth, and Canada Tonight of BCTV and CHCH Television. Iain spent five years as a financial analyst and knows what makes business tick. For fourteen years he operated his own businesses in importing, high technology and manufacturing. He now operates Entrepreneurial Business Consultants of Canada and also owns a book publishing business. He holds degrees from Oxford University and from St. Andrew’s, Scotland. He has successfully raised venture capital and writes from firsthand experience, which he shares with you. 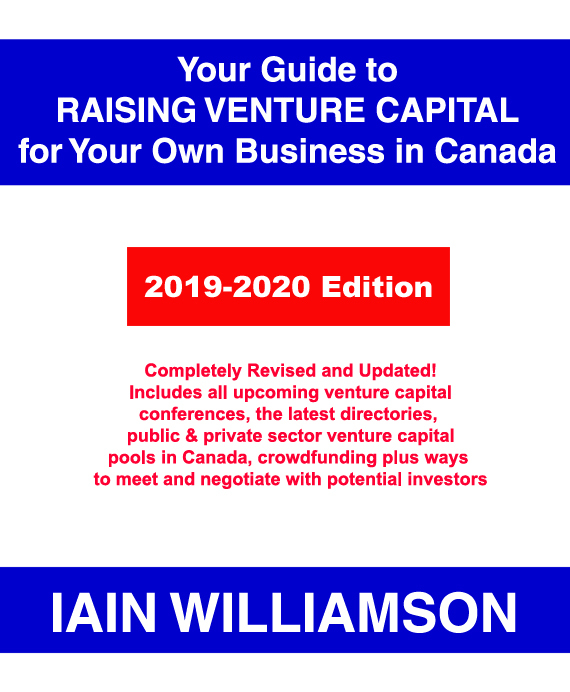 Your Guide to Raising Venture Capital for Your Own Business in Canada: 2018-2019 Edition; by Iain Williamson: 228 pages; Softcover; ISBN 978-1-55270-798-2; ISSN 1191-0534; published in August 2018; Canadian $84.95. How Did This Venture Capital Game Start? Where is the Money Being Invested? What is the Money Being Invested In? What are the Preferred Forms of Investment? What's in it for the Venture Capitalist? CHAPTER 13 Informal Investors or "Angels"
What is Meant by the Term "Angel?" How Many Angels Are There in Canada? Where do Angels Like to Invest? What do Angels Like to Invest In? What Form Does their Investment Take? How Long Does the Average Angel Stay on Board? How Successful Are the Marriages? CHAPTER 18 Equity Crowdfunding from "Micro Angels"
Who Conducts Due Diligence for Equity Crowdfunders and Who Pays For It? How Much Money Has The Small Business Owner Invested? CHAPTER 20 A Word of Caution!